Strawberries are refreshing and delicious. They're extra fantastic when mixed with cheesecake and chocolate. Yum! Rinse strawberries and cut around the top of the strawberry. Remove the top and clean out inside with a paring knife if necessary. I found most of the strawberries already had a nice hollow center so that step was not necessary. If you want to stand your strawberries upright (like in the picture) slice a bit off the bottom. One strawberries are prepped set aside. Combine cream cheese, powdered sugar and vanilla with a mixer or by hand. Add cream cheese mix to piping bag and fill strawberries. 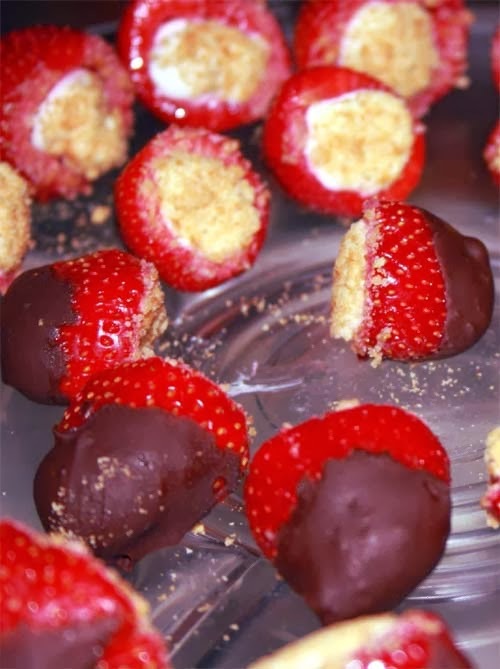 Once strawberries are filled dip the top in graham cracker crumbs. Devour and fall in love. After following the recipe and directions for the cheesecake filling, the strawberries were dipped in a dark chocolate fondue (e.g. Cuisinart CFO-3SS Electric Fondue Maker) and allowed to cool. Simply marvelous! For more fruity treats, see the recipe for raspberry chocolate tart.